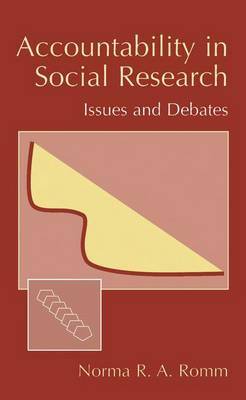 In this book I have concentrated on drawing attention to various conceptions of accountability that might be brought to bear in judging the practice of social research. Much of the book is organized around making explicit the assumptions that influence what counts as "proper" research in society, including assumptions about how social inquirers might be held accountable. My focus is on reviewing discourses around the practice of "professional" inquiry, with a view to reconsidering the way in which people create expectations for accountable social inquiry. My focus hereon is related to my concern that the manner in which judgments about researchers' accountability are made, is not without social consequences for our way of living in society. I have approached the issues by beginning with a discussion of tenets of the position called "positivism" (so named by certain proponents), and by considering the view on accountability that is implied by adherence to these tenets. Briefly expressed, positivist argumentation suggests that researchers are required to "do science" in a manner that warrants their being considered, indeed, scientists. I use my discussion of accountability as seen within positivist argumentation to explicate ways in which alternative positions have arisen as ways of treating accountability issues. Through my way of comparing the various positions, I hope to provide some indication of the complexity ofethical and accountability issues in social inquiry.